Prof. Mohan Krishnamoorthy is Professor of Operations Research at ITEE, UQ and Pro Vice-Chancellor (Research Partnerships) at UQ. 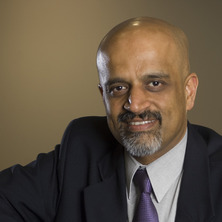 Prior to joining UQ Mohan Krishnamoorthy was Pro Vice-Chancellor (Industry Partnerships) at Monash University and was Professor of Operations Research in the School of Mechanical and Aerospace Engineering, Monash Uni. Prior to that, he was CEO of the IITB-Monash Research Academy, a joint-venture research academy between Monash University and Indian Institute of Technology, Bombay. Before that, Mohan Krishnamoorthy was the Associate Dean Research, Faculty of Engineering (Monash) and before that, from 1992, he was at CSIRO. He obtained his PhD from Imperial College, London and taught at the University of Kent, Canterbury before moving to Australia in 1992. Mohan’s research interests lie in the field of integer/combinatorial optimization. He works on (and has published several papers in) areas and problems such as hub location, rostering, personnel task scheduling, machine scheduling, transportation and port logistics. MSc Operations Research, Delhi University. MSc Management Science, Imperial College London. Ph,D Operations Research, Imperial College London. algorithms for variants of fixed interval scheduling problems. algorithms for scheduling with sequence dependent processing times. optimal content placementry for large scale VoD systems. solving variants of hub location models. The problem is one of locating VOD data in large networks. How do we do this efficiently? What are the difficulties in locating data efficiently to ensure minimal latency and low cost. The problem is one of combining very large neighbourhood search heuristics with decomposition methods and lazy constraints to develop efficient algorithms to solve very large combinatorial optimisation problems. Campbell, James F., Ernst, Andreas T. and Krishnamoorthy, Mohan (2002). Hub location problems. In Zvi Drezner and Horst W. Hamacher (Ed. ), Facility location: applications and theory (pp. 373-407) Berlin, Heidelberg: Springer Berlin Heidelberg. Abdelkader, Yousry H., Ait-Kadi, Daoud, Al-Najjar, Basim, Allahverdi, Ali, Amavasai, Bala P., Henggeler, Carlos, Bouchaffra, Djamel, Bose, Indranil, Brabazon, Anthony, Brdys, Mietek, Cacheda, Fidel, Chan, Alan Hoi-Shou, Chan, Felix T. S., Chang, Chin-Chen, Chaudhuri, Pranay, Chen, Chun-Hsien, Chen, Chung Shue, Chen, Mu-Song, Chen, Qingfeng, Choy, Wallace, Chung, T. S., Clubb, Orville Leverne, Damasio, Manuel Jose, Dang, Chuangyin, Djordjevich, Alexander, Fung, Yu-Fai, Ganesan, G., Leng, Robert Gay Kheng, Sing, Goh Ong, Gracia, Angel Marin, Gu, Zonghua, Gulpinar, Nalan, Heaton-Adegbile, Phil, Herrera-Viedma, Enrique, Herrero, Josep R., Huang, Xu, Hwang, Chi-Kuang, Hwang, Heung Suk, Ishihara, Shigekazu, Jia, Limin, Kannan, Rajgopal, Karatzas, George P., Katagiri, Hideki, Kendall, Graham, Kikuta, Kensaku, Kim, Haeng Kon, Kim, Sung-Il, Kothari, Cartik, Krishnamoorthy, Mohan, Kumamoto, Tadahiko, Kwan, Reggie, Lee, Ho Woo, Li, Layuan, Li, Xueliang, Li, Yiming, Lin, Chih-Min, Liu, Baoding, Liu, Liping, Lopez, Elsa M. Macias, Luk, Clement, Maeda, Kazuaki, Mahanti, Prabhat K., Mahmoud, Qusay H., Matsatsinis, Nikolaos, Mavrommatis, George, McGuigan, Michael, Melin, Patricia, Mikhailov, Ludmil, Mineno, Hiroshi, Monsuur, Herman, Moon, Chiung, Murua, Alejandro, Musliu, Nysret, Nakache, Didier, Ni, Jun, Nolle, Lars, Ozalp, A. Alper, Pang, Wan- Kai, Papadopoulos, Apostolos N., Piramuthu, Selwyn, Premachandra, I. M., Seng, Quah Tong, Sharma, Dharmendra, Sheu, Jiuh-Biing, Sheu, Shey-Huei, Resteanu, Cornel I. G., Romero, Carlos, Saito, Susumu, Sawik, Tadeusz, Seva, Rosemary R., Shakshuki, Elhadi, Singh, Vrijendra, Siskos, Yannis, Stoyan, Yuri Grigoriyevich, Sun, Junping, Sun, Zhaohao, Rad, A. B., Resta, Marina, Rodriguez, Maria Luque, Rojas, Raul, Tiwari, Manoj Kumar, Tran, Dat, Triguero, Francisco Herrera, Tseng, Lin-Yu, Tsuda, Shinichi, Tzeng, Gwo-Hshiung, Utkin, Lev V., Vaz, Ismael, Luis, Jose Verdegay, Wang, Hsiao-Fan, Wang, Long, Wang, Shyh-Hau, Watanabe, Toyohide, Werner, Frank, Wojnicki, Igor, Wu, Ed Xuekui, Wu, Trong, Xie, Guangming, Xu, Li, Xu, Susan H., Yang, Gi-Chul, Yang, Xin-She, Yu, Kun-Ming, Zanni, Cecilia, Zhang, Xiaohua, Zhang, Zhe George, Zhao, Yao, Zhao, Yong and Zopounidis, Constantin (2011) IMECS 2011 - International MultiConference of Engineers and Computer Scientists 2011: Preface. IMECS 2011 - International MultiConference of Engineers and Computer Scientists 2011, 2 . Boland, N, Krishnamoorthy, M and Stuckey, P (2001) Untitled - Preface. Annals of Operations Research, 108 1-4: 13-17. Ernst, Andreas T. and Krishnamoorthy, Mohan (1999) Efficient algorithms for the uncapacitated single allocations-Hub median problem. Recherche - Transports - Securite, 62 139-154. Smith, Kate, Krishnamoorthy, M. and Palaniswami, M. (1999) Neural versus traditional approaches to the location of interacting hub facilities. Recherche - Transports - Securite, 62 155-171. Abramson, D, Krishnamoorthy, M and Dang, H (1999) Simulated annealing cooling schedules for the school timetabling problem. Asia-Pacific Journal of Operational Research, 16 1: 1-22. Mokhtar, Hamid, Krishnamoorthy, Mohan and Ernst, Andreas T. (2017). A new Benders decomposition acceleration procedure for large scale multiple allocation hub location problems. In: 22nd International Congress on Modelling and Simulation Proceedings. 22nd International Congress on Modelling and Simulation, Hobart, Australia, (340-346). 3-8 December 2017. Shrivastava, Himanshu, Dutta, Pankaj, Krishnamoorthy, Mohan and Suryawanshi, Pravin (2017). Designing a resilient supply chain network for perishable products with random disruptions. In: Proceedings of the International MultiConference of Engineers and Computer Scientists 2017, IMECS 2017. 2017 International MultiConference of Engineers and Computer Scientists, IMECS 2017, Hong Kong, (870-875). 15-17 March 2017. Barker, Geoff, Brinschwitz, Kurt, Krishnamoorthy, Mohan and Mills, Graham (1994). Maximizing the value of multi-field developments. In: Proceedings of the Asia Pacific Oil & Gas Conference, , , (485-494). November 7, 1994-November 10, 1994. Krishnamoorthy, M., Mills, G. and Sier, D. (1993). Stockpile planning at Dampier salt W.A. In: Proceedings of the 1993 National Conference on Bulk Materials Handling, , , (73-81). September 22, 1993-September 25, 1993.